As often is the case with the enigmatic Ivory Joe Hunter the musical boundaries he skirts tend to be written in sand rather than carved into granite. That leads to some ongoing identity issues that he – and by extension we – must grapple with over the years. The truth of the matter is Hunter simply considered himself a musician, no self-limiting genre identification needed. If he wanted to play rock ‘n’ roll he would, just as he would the blues, jazz, country or probably zydeco, reggae and death metal if the mood struck. In fact artists in general are far less concerned with labels than the general public and writers are. While the latter groups feel the need to classify things for making easily understood connections, the artists themselves, while usually pretty closely aligned with a particular style, don’t like to feel bound by it. Ivory Joe Hunter, more than most, epitomized this mindset. To him any opportunity to make music was something to be cherished, not categorized. But that doesn’t help US here (not that Hunter, who died in 1974 long before any of us were around, should be expected to take that into consideration). So we’re left with trying to pick through his ever-changing diverse stylistic output in an attempt to tell his story as it pertains to rock music without shortchanging him in the process. It isn’t always easy… but then again, rarely does easy equate with worthwhile, so here we are again making a bit of a compromise in a belated attempt to show just how Hunter’s musical mind worked. 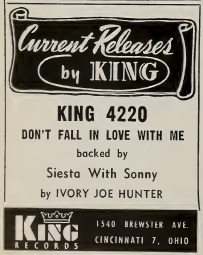 If you were familiar with Hunter’s extensive releases, or King Records discography for that matter, you’d surely expect to see King 4220 in the roll call for the records issued in the spring of 1948. It was a hit after all and after a few commercial duds it was also the first tangible return the company had gotten on their signing of Hunter the previous fall. But the “hit” side isn’t a rock side no matter HOW flexible we are with our definition. At a certain point the credibility of a website claiming to be The History of Rock ‘n’ Roll Song By Song would be called into question if the songs being presented in that history were not remotely close to rock, but rather something else entirely. Such is the case with Hunter’s Don’t Fall In Love With Me, a pure pop performance any way you slice it. The few moments within where Ivory Joe’s vocals take on a slight hint of emotional urgency aren’t nearly enough to get me to render the entire premise of Spontaneous Lunacy irrelevant just to be able to tell you about that record’s success. A success by the way which surely had as much or more to do with listeners being so enamored with his recent Pretty Mama Blues that they rushed out to grab anything with his name attached. But just so it’s not completely shunned in these pages thereby leaving a gap in Hunter’s story I’ll use this small space to tell you that while it’s competently done for what it aspires to be – classy and demure, if sleep inducing – that record represents the alternative road Hunter had laid out before him at this point in time of his career. It might’ve been one that resulted in just as much success as the rock road he eventually traveled down more or less consistently over the next decade, but it certainly wouldn’t be a road we’d follow. In fact had he chosen that path and stuck to it exclusively we likely wouldn’t have covered his earlier rock-lite King sides here leaving only Pretty Mama Blues (and a vital pre-rock side – Jamming Down In Town – from earlier in 1947) to stand as a testament to his potential as a rock artist and even that needs to be clarified so as to read: His potential as a fairly mild rock artist. And that’s of course what he became for the most part. A skilled balladeer in a genre that often looks down on that side of the equation. Rock fans will embrace someone who usually takes a much more aggressive approach if they occasionally tone things down for a ballad or two along the way, but just don’t make a habit out of it otherwise you’re at risk from being expelled from the union. Hunter largely ignored that directive but his overall stature, while probably taking a hit historically for that tendency for mellower styles, still managed to remain fairly high for three decades as other rock acts admired his prodigious skills as a songwriter, singer and pianist. Their ongoing association with him also reconfirms what we mentioned earlier – that artists themselves generally have fewer boundary restrictions than the rest of society does. All of that explanation to merely get to the reason why King 4220 DOES manage to slip in the back door of rock history, or at least the B-side of the record does. Even that’s not a seamless fit by any means and it’s something that was originally left out altogether without much nagging regret, but ultimately Siesta With Sonny does show something worth noting about Hunter’s rock credentials and though a very schizophrenic performance overall with the musicians seeming to view it in far different ways, oddly enough for once the guy who adheres closest to the rock ground rules is Ivory Joe Hunter himself. Strange then that the song, an instrumental, is named for drummer Sonny Greer. Considering that his role on this is incidental at best I can only think that it was a joke at his expense, chiding him for falling asleep behind the kit as they went about laying the recording down. Greer’s not completely inaudible, he’s playing a faint shuffle most of the time with a few more emphatic accents along the way, but there aren’t any moments where he really makes his presence known, hence perhaps the “siesta” dig. But then again as we’ve seen many times so far and will see again in the future instrumentals are always in search of catchy intriguing titles and I suppose Siesta With Sonny qualifies in that regard, though it also belies the sounds awaiting you once you cue the record up, because for the first time with Hunter’s output the resulting work is hardly something that comes off as being too restrained. Now don’t let that get you too worked up, for while it doesn’t feature a timid arrangement as was too often the case with Ivory Joe, it also doesn’t completely cut loose either, though admittedly they definitely seem to try which makes this a good contrast to the type of work he’s laid down to date in rock. What trips them up somewhat in that goal – and pardon me if you’ve heard this one before – is the overreliance on the trumpet in the arrangement. Shocking, I know. 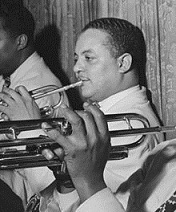 For the most part there’s two dominant instruments on Siesta With Sonny, Harold “Shorty” Baker’s trumpet and Hunter’s piano. Though their parts are clearly worked out and have the same destination in mind, they’re using much different forms of transportation to get there. It’s as if Hunter is taking a sleek high-powered train while Baker is riding in a hot air balloon or something. As a result though they don’t get in each other’s way, they also aren’t enjoying the same view or making the same time. The trumpet, as we keep saying, has a tone that is too harsh, almost fragile in a way, to mesh well with rock’s more assertive sensibilities. It also doesn’t mesh well with Hunter here, who finally shows us – at least a little – why he was once considered among the strongest boogie woogie pianists in Texas and later California. Though he’s certainly not making a big show out of it, nor pounding the keys with a barely controlled fury as Forrest Sykes recently had, he is playing an effective walking bass throughout the performance and as it goes on he’s adding more embellishments with his right hand to show that he does indeed have a pulse in him. I know that sounds like a knock but as keeps being reiterated each time we meet him, with Ivory Joe his mellow persona was often his biggest detriment, as by the sounds of his records at least he seemed more content to create in sterile environments than perform in crowded venues where he had to incite an audience to get on their feet and stay there. Often times the only the time they would’ve with him on the stage was if their leg fell asleep and they had to stand up and move around to get it to stop tingling. But that’s hardly the case here, because Hunter is fully committed to making them move due to the energy of his playing which becomes more evident in the song’s second half. Maybe not surprisingly this is also the point where the trumpet takes a back seat to Russell Procope’s saxophone (alto unfortunately, rather than tenor) which further invigorates the proceedings. Though the alto isn’t as suited for honking as either the tenor or baritone, Procope plays for all he’s worth and does a very solid job, and even when he then lets the infernal trumpet back in it seems as if even Baker has been swayed by what he’s just heard. The closing has them all ramping up their performance to the point where it actually seems completely suited to the rock landscape and may have you wondering why there was any reservations about including Siesta With Sonny in the first place. Of course that’s good arranging at work, the idea of leaving the stage with your strongest passage still ringing in their ears, but while we’re certainly enthused as it fades into the night air come closing time and we’re all jostling to get back onto the boulevard to make our connections for the after-hours activities, we can’t forget how long it took them to reach that point in the song. Since a record is more than just its best (or worst) attributes, that earlier conflict has to be taken into account which drags this back down some. But just a little, for on the whole this one isn’t that bad at all. Better than anticipated for sure and evidence that Hunter had it in him to provide rock ‘n’ roll with more vitality than he’s often given credit for, even by those who hold him in high esteem for his quintessential ballads. What it shows best is that while his instincts were solid the execution of the game plan was hampered by the components that were in the process of being shed in rock and left behind as stately mementos from an earlier era. Since this was cut back in December of 1947 we can’t place too much blame on any of them for that, but in the future certain adjustments would have to be made for this to get any stronger consideration, the likes of which I’m sure you can guess. Drop the trumpet, or leave it until the end when it could be called in to bolster the final refrain as part of the cavalry, switch the saxophone from alto to tenor, or perhaps add another on baritone as well, let one or the other handle the trumpet’s parts in the first half, then have the other take on the role of the alto in the break working itself into a frenzy, maybe give Hunter and the drummer a few more moments to shine along the way and then you’d have something really good here. That probably seems like a lot of alterations to make in order to pass muster as a full-fledged rocker, but it’s really not. Actually it’s nothing more than a matter of timing. Siesta With Sonny was looking forward stylistically from a moment in the recent past but their feet were still stuck in that past. Once they got moving and simply caught up to the present they wouldn’t have to be roused from their siesta to get things jumping, they’d already be wide awake and raring to go. 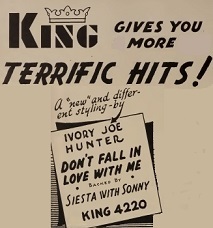 Leave a reply on "Ivory Joe Hunter: “Siesta With Sonny”"